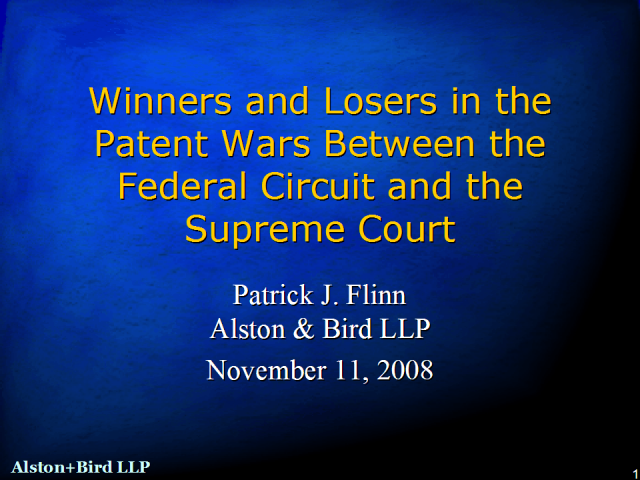 This discussion will review the recent interest the Supreme Court has shown in the are of patent law (such as the decisions in eBay, KSR, and Quanta), discuss the likely continuation of that trend, and describe what the Federal Circuit has been doing as a result. This interactive panel presentation features three panelists who will each share their own regional perspective and expertise on the decision-making behind patent portfolio management. Mr. Schwaab of DLA Piper (Silicon Valley, US) will start our panelists with key concepts for selecting IP and making decisions of greatest strategic value to maximize benefits from patent filings. Mr. Williams of Cleveland (London) will discuss global patent foundations enabling patentees to successfully navigate the EPO's new laws and reduce prosecution costs (in Europe and beyond), while maintaining robust protection in the U.S., Asia and beyond. Essential aspects of ordering and timing prosecution of inventions filed in multiple countries will be covered by Mr. Ryuka of Ryuka Law Firm (Tokyo), who will provide his winning insights into various adjustments to make as well as the merits thereof. Moderator Dale Lazar will lead the panelists through this discussion and field an in-depth question & answer session for participants at the end. Brands can be powerful and extremely valuable. Your company may take every step imaginable to establish and enforce its trademark rights. But is that enough? What can you expect from a statute that is primarily designed to protect consumers? Nate Garhart and Deborah Davis Han will use role-playing and real-life examples to present a lively discussion of the changing expectations of trademark owners in a Web 2.0 world. Learn how the explosion of Facebook, MySpace, YouTube and other social media sites has affected trademark law and rights, and how to protect your valuable brands on these new Internet sites. In this trademark law overview, you will learn the basics of trademark law, including the following: Items which can serve as trademarks; how trademark rights are created; the differences between registered and "common law" marks; how to choose, clear and protect strong brands; dealing with trademark conflicts (infringement); when to use the "tm" and "(R)" symbols; and how can trademark rights be weakened or lost? This presentation is geared toward lawyers and decision-makers desiring a basic understanding of these legal concepts. Tom specialises in developing brand protection strategies for growing and ambitious companies that contribute to their business goals. He provides tenacious and pragmatic defence of important IP rights through effective use of the registration system including the opposition processes. Tom has in-depth experience in the clothing/footwear/accessories industry where his understanding of the interrelationship between IP rights is key to the effective protection of brands and designs. Similarly, this understanding has helped clients in the fields of software and business/financial services and medical/pharma products. Business School and has set up and run his own business. Mike Rodenbaugh presents a detailed overview of the growing problem of abusively registered domain names, enabling cybersquatting, counterfeiting, trademark infringement, copyright infringement, phishing, malware distribution and distribution of other criminal and/or infringing material. International enforcement options will be outlined, including notices to enabling parties, arbitration and litigation. The presentation concludes with a brief discussion of the current status of various policy initiatives of ICANN, including efforts to mitigate abusive behavior in new top-level domains (TLDs), the Registration Abuse Policies Working Group, and efforts to amend the Registrar Accreditation Agreement. Mike is the principal attorney at Rodenbaugh Law, a small law firm in California which represents businesses in all matters of trademark and copyright protection and enforcement. Mike formerly was the primary trademark enforcement attorney for Yahoo! Inc. for more than seven years. Mike represents the Business Constituency at ICANN (bizconst.org), as an elected Councilor to the Generic Names Supporting Organization (GNSO). The GNSO Council develops ICANN policy with respect to generic TLDs such as .com, .mobi, .museum, .travel, .jobs and many hundreds more coming in 2010 and beyond. Effective and cost efficient strategies for navigating patent and other IP litigation in these challenging economic times. From early case assessments to winning and bold litigation concepts to help in-house counsel properly balance and control the rising costs of major case litigation. With litigation costs and awards significantly increasing, many are seeking answers outside of the courtroom. Controversial legislation to revamp the law of damages, challenges to patents outside the court, venue and more is held up again in Congress. If passed, the legislation could mean dramatic changes to your business model and patent strategies. Jon W. Dudas served as Under Secretary of Commerce for Intellectual Property and Director of the United States Patent and Trademark Office (USPTO) until January 18, 2009. He was nominated to the position by former President George W. Bush in March 2004 and appointed in July 2004. Dudas previously served as acting Under Secretary and Director, and Deputy Under Secretary and Deputy Director from 2002 to 2004. In 1981, the U.S. Supreme Court last answered the question of "what is patentable" in Diamond v. Diehr during a time when the Internet, software, financial products and biotech industries were at a nascent IP stage. Jumping forward 28 years, the Supreme Court has now decided it is time to revisit that same question in In re Bilski to be heard in December of 2009. That decision is intended to clarify whether inventors can patent financial business products, software, Internet business processes, or biotech diagnostic processes. This Webcast will discuss In re Bilski and whether the Supreme Court will pull back from its oft-quoted statement that "everything under the sun that is made by man" is patentable. Michael Molano is Partner in the Silicon Valley office of Sheppard, Mullin, Richter & Hampton LLP, an international law firm with over 550 lawyers in the U.S. and Asia. He concentrates his practice in patent litigation, patent prosecution and transactional intellectual property matters. Mr. Molano received a B.S. in Electrical Engineering from Northwestern University and a J.D. from St. Louis University School of Law. David Donoghue draws on his IP litigation experience, as both outside counsel and in-house counsel for a Fortune 100 company, to identify ways to reduce what too often become massive litigation fees and expenses while actually improving the effectiveness of your legal team. Mr. Donoghue looks at the relationship of inside and outside counsel and identifies specific ways to optimize that relationship to focus costs on action items that promote your business needs and, by doing that, to increase your legal team's focus on the business drivers and goals in the case instead of a generic plan to "win" the case. Mr. Donoghue also pulls the curtain back on joint defense groups and identifies straightforward techniques for managing joint defense groups in order to avoid unnecessary expenses while deriving the synergy expected from the groups. Mr. Donoghue also identifies ways to manage and control a discovery process that too often takes on a life of its own. Finally, Mr. Donoghue will answer participants questions to identify solutions focused upon your specific needs. Ray Beckerman, Attorney at Law, Ray Beckerman, P.C. Veteran New York City business litigation attorney Ray Beckerman, author of the popular copyright law blog “Recording Industry vs. The People”, will discuss recent developments and key issues in the RIAA’s litigation campaign against individuals and families. 1. How the RIAA gets ISP’s and institutions of higher learning to “name names”. 2. The nature and quality of the “evidence” the RIAA has when it starts the litigation process. 3. Why there are so many false positives. 4. What the RIAA alleges in its complaint, whether this meets the standards for pleading copyright infringement, and what constitutes a “distribution” under the US Copyright Act. 5. The economics of the lawsuits and the effect that has on outcomes. 6. Whether the RIAA’s claim for “statutory damages” passes constitutional muster. 7. Recent events and likely trends. 8. What effect the litigations have had on the music business. Four years ago, a broad class of authors and five publishers filed lawsuits against Google Book Search. Last October, Google, authors, and publishers announced a groundbreaking settlement agreement that will dramatically increase access to millions of books in the US and create a new market for authors and publishers to sell their works. This talk will discuss how Book Search and the settlement benefit rightsholders, libraries, and readers. Howard Knopf, Counsel, Macera & Jarzyna/Moffat & Co.
Howard Knopf, Counsel to Macera & Jarzyna, LLP in Ottawa Canada is has been involved in the making of copyright legislation, international work at WIPO and for NGOs, advocacy in the Supreme Courts of both the USA and Canada, and Canadian Federal Court, Federal Court of Appeal and Copyright Board work for almost three decades. • What we know, don’t know and need to know about the mostly secret ACTA negotiations. Will iPods and laptops be seized at the border? Will ISPs have to implement a “three strikes” regime that could deprive countless ordinary households of internet access? • Whither WIPO? In particular, what is the status of a possible treaty for the rights of the blind, and other current initiatives? WIPO has been unable to make any progress in international norm setting since 1996 - in copyright or any other substantive area. This is a potentially important crossroads for the organization that is home to the Berne Convention. • Canada has had two recent copyright reform bills that died due to federal elections. The second bill (C-61) was very responsive to US entertainment industry lobbying, but also very controversial. What was in Bill C-61 and where are things likely to go from here? Should Canada be on the USTR’s s. 301 Priority Watch List? Will Canada be an international bellwether for the future of copyright reform? E. Michael Harrington, Professor of Music, Music Management & Intellectual Property and music copyright expert witness/consultant, will present a four-part analysis of the present troublesome state of affairs in the music industry. The focus of the presentation will revolve around the often confusing and competing roles of copyright, creativity, ethics, technology and business. Beginning with the reasons why copyright exists and how it is supposed to function, Harrington will demonstrate why copyright succeeds and fails, how it has changed in light of new technology, and how new technologies ranging from social network sites (Twitter, Facebook, MySpace and others) to file sharing applications and services (LimeWire, PirateBay, Mininova, BitTorrent and others) have been and will remain far ahead of the music and entertainment industries, attorneys and legislators. Secondly, he will describe the four principal reasons why copyright law is often inadequate and frequently unobserved. Thirdly, he will discuss the present “solutions” to the problems posed by the new technologies, spanning the gamut from extreme anarchy to moderate middle-of-the-road measures to draconian proposed federal legislation and the ineffective “sue ‘em all” fervor of the entertainment industry. Cases pertaining to current issues of the digital delivery of IP, including MGM v. Grokster, Twentieth Century Fox et al. v. Cablevision Systems Corporation et ano and Atlantic Recording Corp., et al. v. XM Satellite Radio Inc. will be discussed. Finally, he will recommend more realistic and more daring solutions, as well as a glimpse of what new music copyright issues will arise in 2009 and beyond. Shrinking IT budgets and fierce competition among software publishers have created explosive growth in the incidence and frequency of software audits - a mechanism by which software publishers investigate their customers to determine if they are in compliance with software licenses and copyright laws. In addition to developing internal enforcement operations, many publishers have engaged trade associations to perform enforcement activity under power of attorney. Many companies are paying substantial fines and suffering negative publicity. Properly preparing for and responding to software audits can reduce the financial and organizational impact on your business. According to the BSA's Sixth Annual Global Software Piracy Study, "...a large portion of non-compliant software is deployed by mistake, either by consumers buying cheap software that they do not realize is counterfeit, or by IT departments making mistakes in managing volume licenses." Businesses that are most prepared and properly represented will have the greatest success in defending the inevitable software audit. Creative Commons is a non-profit organization that provides free tools that allow authors, scientists, artists, and educators to protect their creative work with different levels of protection. My presentation will dive into Creative Commons' history, our mission, and how our legal and technical tools work on the web. I'll also detail interesting case studies of how our licenses have been used in the wild and finally explain what the future holds for CC. The importance of intellectual property protection is a key factor for economic growth and advancement in the global economy. Economists estimate that two-thirds of the value of large businesses in the U.S. can be traced to intangible assets. With the increasing importance of intellectual property in an information economy, so to increases the risk of infringement. This channel will see leading IP experts discussing trends and developments in intellectual property law and strategy, offering comprehensive advice for managing IP assets, and protection from infringement.